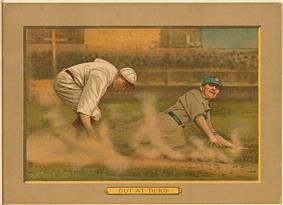 A 1911 American Tobacco Company baseball card illustrating a baserunner being tagged out at third base. In baseball, an out (also informally "away" or "down" when mentioning the number of batters currently out) occurs when the defensive, or fielding, team effects any of a number of different events, and the umpire rules a batter or baserunner out. When a player is called out, he is said to be retired. When three outs are recorded in an inning during a team's turn at offense, that team's half of the inning finishes, and it is said that "the side is retired." The most common ways batters or runners are put out are by strikeouts, fly outs, tag outs, and force outs, however there are many somewhat rarer ways an out can occur. he is found to have used an altered bat. the batter-runner does not return directly to first base after overrunning the bag and he is tagged with the ball by a fielder. he is found to be an illegal substitute. he runs the bases in reverse order in an attempt to confuse the defense or to make a travesty of the game. In baseball statistics, each out must be credited to exactly one defensive player, namely the player who was the direct cause of the out. When referring to outs credited to a defensive player, the term putout is used. Example: a batter hits a fair ball which is fielded by the shortstop. The shortstop then throws the ball to the first baseman. The first baseman then steps on first base before the batter reaches it. For this play, only the first baseman is credited with a putout, while the shortstop is credited with an assist. For a strikeout, the catcher is credited with a putout, because the batter is not out until the pitched ball is caught by the catcher. (If the catcher drops the third strike and has to throw the batter-runner out at first base, the first baseman receives the putout while the catcher receives an assist.) When an out is recorded without a fielder's direct involvement, such as where a runner is hit by a batted ball, the fielder nearest to the action is usually credited with the putout. Although pitchers seldom get credited with putouts, they are credited with their role in getting outs through various pitching statistics such as innings pitched (a measure of the number of outs made by the pitcher, used in calculating his ERA) and strikeouts.